Purpose: Use this document as a reference for (partially or fully) receiving against a line (either by quantity or amount) in ctcLink. The CtcLink Purchasing receiving business process enables you to receive, inspect, return, and put away received goods. You can receive inventory or non-inventory items, with or without associated purchase orders. Direct ship orders are not eligible for receiving, because they are normally sent directly to a customer site and received there. In the Receipt Number field - leave the default value of NEXT (unless your business practice directs otherwise). If this is a PO Receipt, leave the checkbox selected. Otherwise, unselect the checkbox. Enter your search criteria and press Search. 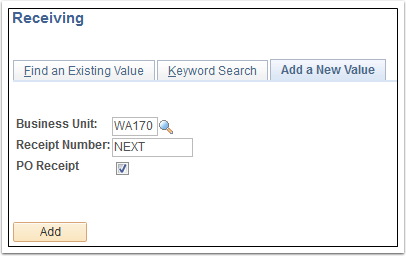 The search functionality of this page enables you to perform a broad or narrow search on purchase orders based on a variety of search criteria. Select the row for the appropriate PO and press OK.
No Order Qty (no order quantity) – Select this option to signify that the receiver must enter the actual quantity received. This selection requires a live count of the items prior to receipt in the system. If selected, the copy function does not transfer order quantities to the receipt. You will need to manually enter all receipt quantities. Order Qty (order quantity) – Select this option to automatically make the received quantity the purchase order quantity. This selection makes the receipt quantity the purchase order quantity regardless of any prior receipt quantity. PO Remaining Qty (purchase order remaining quantity) – Select this option to have the receipt display the numeric difference between the quantity ordered and the current quantity received. Selecting this option replaces the received quantity with the quantity that has not yet been received. Click Interface Asset Informationlink to access the Pre-AM1 page. Use this page to preview and correct data that is being sent to Asset Management. If the stock is to be tracked as an asset, enter asset information, including serial, asset IDs, and asset tag information, using the Asset Management Information page.